The life of Henri Matisse was a lustrous one and author Patricia MacLachlan has made it utterly accessible to the very young in this gorgeous book. 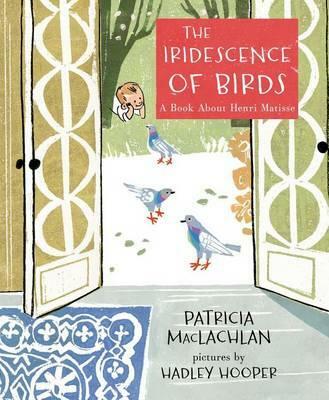 ... the author takes us on a journey through the childhood of this renowned painter, from his early years in a dreary northern French town. To combat the dreary, Henri's mother coloured his world with hand-painted plates, arrangements of fresh fruit and flowers--and red rugs all over the walls. Is it any wonder he grew up to be one of the world's finest artists? The text in this book is lyrical and a little abstract at first--but its delicate detail and thoughtful ending touch the heart. I love that the narrative is done in a way that's enchanting and yet sits firmly outside-the-square of traditional storytelling. I SO love that. Hadley Hooper's imagery is gorgeously-constructed using relief printing (made by cutting characters on stiff foam and cardboard) and the results are a joy--with lush sweeps of colour in oranges, reds and yellows, blues and greens, and the sweet inclusion of Henri as both adult and child--sometimes on the same spread (and giving us a haunting sense of place and time). A must for lovers of illustration and biographical story. A real standout.